Rebecca McGregor was born in the western suburbs of Melbourne and at ve years old, moved to a small town in regional Victoria with her mum and three sisters, where the girls spent their childhood playing sports, riding horses and train-tripping down to Melbourne to visit their father. After high school, Rebecca moved back to Melbourne to complete a Bachelor of Arts and a Bachelor of Teaching at the Australian Catholic University. She began teaching in 2002 and continued after to moving to Gippsland with her husband. Rebecca now lives with her husband and their small son, Clay, and is enjoying being a mum, teaching part time and embarking on this new journey of being an author. 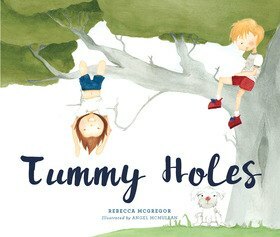 Tummy Holes is her rst book.